College students question the President Wilson. Library of Congress, Manuscript Division [reproduction number: LC-USZ62-31799, digital ID: (b&w film copy neg.) cph 3a32338]. Last week, thousands of women attended the Centennial Women’s Suffrage March, and walked from the Capitol to the Washington Monument in celebration of the 100th anniversary of the 1913 Women’s Suffrage March in which Alice Paul and many other suffragists demanded the right to vote the day before President Wilson’s inauguration in Washington D.C.
Annie Smith Peck participated a great deal in the suffrage movement – from marching in suffrage parades and acting as president of the Joan of Arc Suffrage League to writing numerous editorials in favor of suffrage. This being said, she always seemed to want to have things done her way – even if it meant quitting the show before it was over. In 1911, a woman walked into the Women’s Suffrage Headquarters in New York to purchase a ticket to the next political meeting on the votes for women movement. So the secretary, then recognizing Miss Peck as the famous mountaineer, had no further hesitation in presenting her with a second gallery ticket. 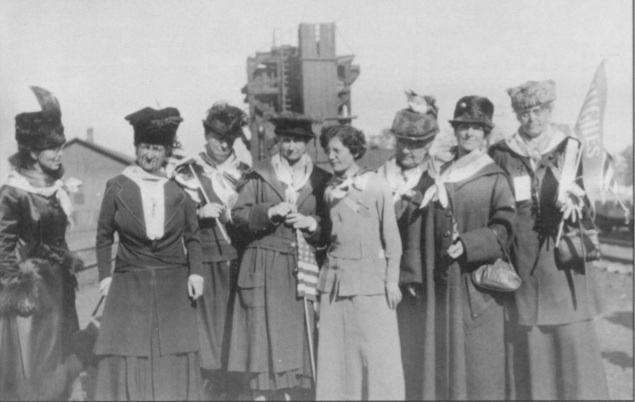 Women on the Hughes Special Train. Annie S. Peck is pictured on the far right. So, in celebration of both Women’s History Month and the 100th anniversary of the Women’s Suffrage Parade in Washington D.C., I leave you with a modern-day take on suffrage – an Emmy Award-winning video created by Soomo Publishing that is an homage to the women who fought for our right to vote. I especially like the reference to Tennessee state legislator Harry Burn. As in real life, in the video, he looks at his red rose (signifying opposition to women’s suffrage) and the note in his side pocket written by his mother, which tells him to “be a good boy” and “vote for suffrage.” Previously planning to vote “nay,” at the last minute, Burn followed his mother’s advice by breaking the tie in favor of ratifying the Nineteenth Amendment and guaranteed all women the right to vote. Legend has it that poor Harry had to hide in the attic of the capitol until the mob that was after him desisted! There is also reference to suffragists being force-fed – a horrendous practice used on hunger-striking suffragists who were jailed for demonstrating in public. Yes, this was really done to women who wanted the vote! And of course, the lyrics “I want to wear pants! I want my suffrage! And independence!” remind me of Annie. WARNING! You may never be able to sing along to the real lyrics to Lady Gaga’s “Bad Romance” again, but I think this video is totally worth the risk. Enjoy! This entry was posted in Uncategorized and tagged 19th Amendment, Annie S. Peck, Annie Smith Peck, Bad Romance, Centennial Women's Suffrage March, Charles Evan Hughes, Hannah Scialdone-Kimberley, Harry Burn, Harry T. Burn, Lady Gaga, Soomo Publishing, suffragists, women's history month, women's suffrage, Woodrow Wilson on March 12, 2013 by Hannah Kimberley. What a great blog! Thanks so much. The video was inspiring! Need reminders of what we take for granted. Enjoying a first visit to your great blog and look forward to reading more! A favorite family photo of mine is of my grandmother at the 1920 MO State Fair, driving a model T covered with flowers and full of women wearing banners of “Votes for Women”. So glad to learn more about Annie Peck. Thank you! Hi Ann. I am so glad that you found my blog, since it means that I have now found yours. The photo of your Grandmother B. is a hoot! What a wonderful character she must have been, and what a treasure you have in 40 years of letters that are in CHRONOLOGICAL order with marginalia, ephemera, and recipes to boot (annbkennedy.blogspot.com)! Thanks so much for visiting my site, and I am very much looking forward to reading about the adventures of the women in your family. I read Kim Smith’s very nice piece about your blog on Good Morning Gloucester–so glad! Love your blog I always push all my women friends to vote and I say remember when they kicked us out of the line for just being women, feel so silly I never looked up all the important women who fought so hard for women to vote. Women Rule…. Thanks, Patti. So glad you are enjoying the site. I would love to read more about you getting kicked out of line! If you have the time, can you tell us what happened and why? I also found your site through GMG and enjoyed this story very much. Looking forward to reading new entries on your blog. Thanks for visiting, Mary. I look forward to writing more about Annie. Hi Hannah, many thanks for this delightful post — and on the blog as whole. Very glad to see you’re continuing your work on Annie. I have had a couple of media queries in the past week looking for info on her, and would like to forward them on to you — drop me a line when you get a chance and I will forward them directly. Annie and everybody would, could, and should be proud of (if nothing more) progress as it relates to love and respect for our fellow man/woman-kind.